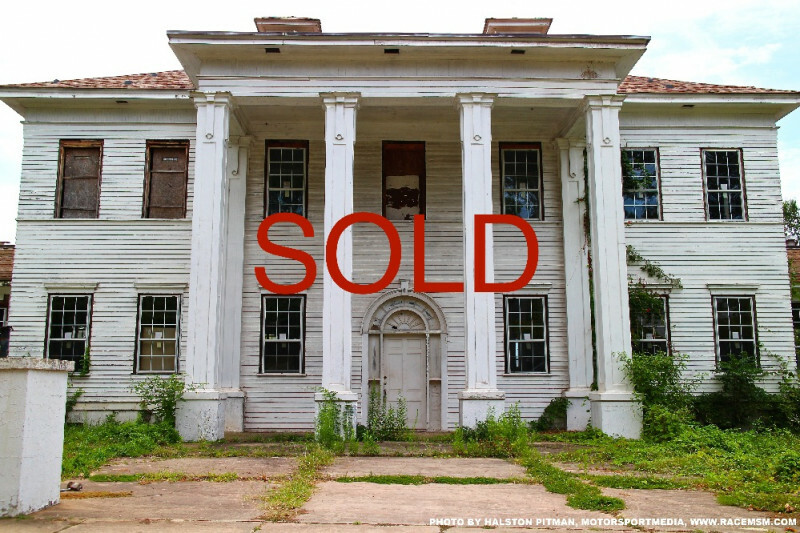 Haisten's Building in Griffin, GA has SOLD! Thank you to all that followed and supported this GoFundMe- you made a difference in our town! The Griffin-Spalding Historical Society is thrilled to announce that Griffin's 2nd oldest hospital, commonly referred to as the Haisten's Building, was sold this week to buyer Justin Flynn, who plans to develop it into a creative space for local and new businesses. The property was sold through an agreement with Griffin's Land Bank Authority and the Georgia Trust for Historic Preservation, and the purchase was made public Thursday, March 9th, 2017 at the Land Bank Authority's monthly meeting. Chairman Newton Galloway publicly thanked the Griffin-Spalding Historical Society, the Georgia Trust for Historic Preservation, Land Bank Authority Board Members and Executive Director, the City of Griffin, and Home Depot for their support and leadership throughout the process of finding a buyer for the building. Built in 1910 as Griffin’s second hospital, the building replaced an antebellum wooden house used as Griffin’s first hospital on the site of old city hall at 6th and Solomon. When the first hospital was demolished to build city hall, materials were reused to build the second hospital located on Meriwether Street, and plans were donated for the structure by architect Harlason Bleckley. At the time of construction, the building’s estimated value was $25,000, but was built for $15,000 thanks to the reuse of materials and generosity of local banks. This building served as Griffin’s Hospital and Nurse’s Dormitory until the 1930’s, when Strickland Memorial was purchased by the city from Dr. Hunt (located at 8th and West College). At that time, the Haisten’s family purchased the building and operated Haisten’s Brothers Funeral Home until the mid 1990’s. The building stood vacant for several decades, and was slated for demolition by the city in April 2015. The Griffin-Spalding Historical Society and the community rallied to raise funds to stabilize the exterior through this GoFundMe campaign, collecting over $15,000 plus material donations from local businesses, which effectively stopped the proposed demolition of the building. In addition, Griffin’s Home Depot store coordinated a Team Depot work weekend, bringing over 200 volunteers from 10 different Home Depot stores to repair the exterior of the structure. Lookout for coverage of the Haisten's Building sale in an upcoming issue of the Griffin Daily News, or attend the historical society's Rocking Chair Remembrances Historical Luncheon on Sunday, March 19th at 12:30pm to learn more about the new buyer and his proposed plans. Please email Executive Director Brittany Stikes at gshs196@gmail.com to RSVP to the luncheon. Want to see the interior of the Haisten's Building? Preserve Griffin is the Griffin-Spalding Historical Society's fund for the stabilization and restoration of historic properties in Griffin, GA. We work with the City of Griffin/ Spalding County Governmental partners, The Georgia Trust for Historic Preservation, the Land Bank Authority, Housing Authority, and preservation minded people/ buisnesses to identify ways we can effectively enable preservation, and spur others in the community to do the same. Learn more about the Griffin-Spalding Historical Society on our Facebook page or at http://www.griffinhistory.com. Griffin, GA is a town ripe for economic development through the restoration of historic buildings. Located in the next town over from Pinewood Studios Atlanta, Griffin has reaped the benefits of the recent movie filming boom that south metro Atlanta has experienced. In addition, an upcoming airport expansion, new business park, and picturesque downtown make it an ideal place to live and work. The Griffin-Spalding Historical Society is thrilled to announce that Griffin's 2nd oldest hospital, commonly referred to as the Haisten's Building, was sold this week to buyer Justin Flynn. The property was sold through an agreement with Griffin's Land Bank Authority and the Georgia Trust for Historic Preservation, and the purchase was made public Thursday afternoon at the Land Bank Authority's monthly meeting. Chairman Newton Galloway publicly thanked the Griffin-Spalding Historical Society, the Georgia Trust for Historic Preservation, Land Bank Authority Board Members and Executive Director, the City of Griffin, and Home Depot for their support and leadership throughout the process of finding a buyer for the building. In 2015, the Haisten’s Building was named to the Georgia Trust for Historic Preservation’s Places in Peril List, as one of the top 10 buildings to save in Georgia. The Griffin-Spalding Historical Society and the community rallied to raise funds to stabilize the exterior through a GoFundMe campaign, collecting over $15,000 plus material donations from local businesses, which effectively stopped the proposed demolition of the building. In addition, Griffin’s Home Depot store coordinated a Team Depot work weekend, bringing over 200 volunteers from 10 different Home Depot stores to repair the exterior of the structure. Thank you to everyone who supported these efforts through the Preserve Griffin GoFundMe page- you made a difference in our community! 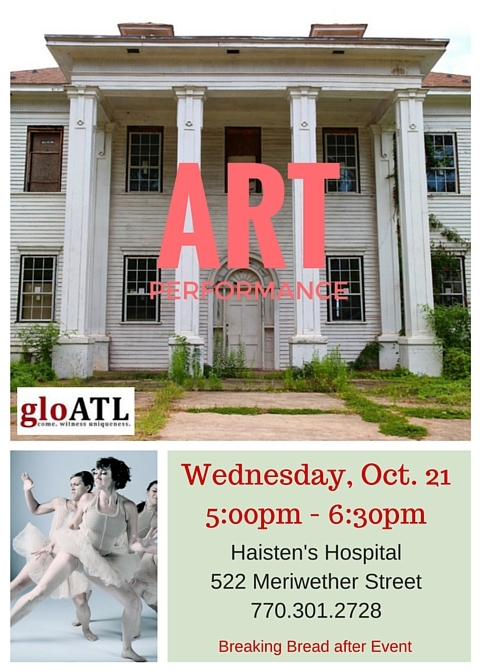 Wednesday night from 5-6:30pm, come to the Haisten's Building to see a live art performance by GLO Atlanta as part of their weeklong artist residency. You don't want to miss these famous artists in Griffin, who are partnering with the Georgia Trust to bring attention to historic buildings on the Places in Peril list. Hope to see you there! Rain should clear out by lunch! 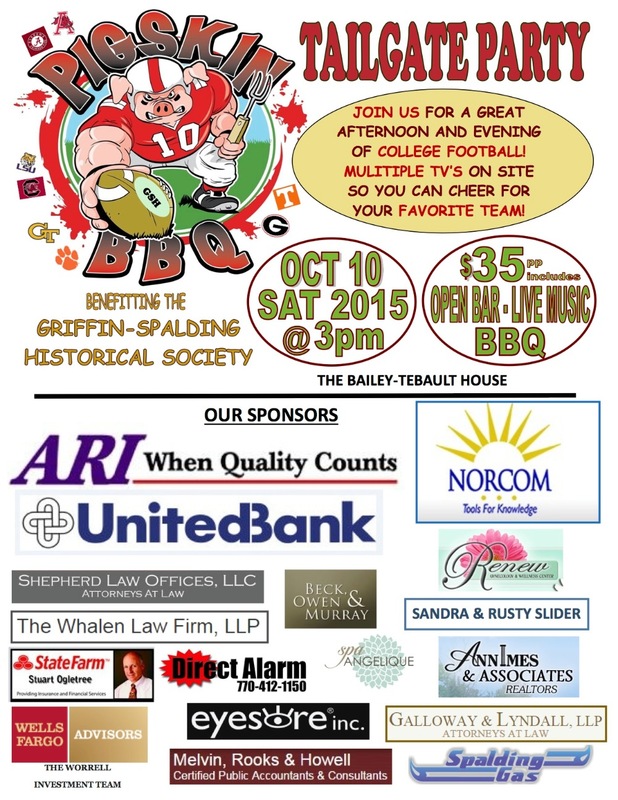 Join us for a great afternoon of football, food, and fun at the Bailey-Tebault House! Proceeds benefit the Griffin-Spalding Historical Society's mission to promote preservation in Griffin. Spread the word. Buy your tickets online or at the door. Our wonderful Preserve Griffin partner Home Depot has an awesome event this weekend! Depot Dash 5k this Saturday, benefitting Rushton's Hope Charity! Registration starts at 7am at Griffin's Home Depot, race starts at 8am. The cost for the race is $25 per runner. At 9am they will start a free fire safety day for the kids, with inflatables, live music, food, fire trucks, etc. Bring the kids and join the fun! Think what the possibilities are with this historic building! Our group is not asking for any Griffin/Spalding Tax Payer funds--all private funding or from a developer. I went inside last week, it's really NOT as bad as it looks from the outside. Inside it's REALLY REALLY cool building: 2 floors, a walk up attic and basement. Let's rally together to make a difference!! The LAST thing Griffin needs is another VACANT lot where one of our historic structures once stood! These buildings (restored) are what make our City charming and draw new folks! I took an outside developer inside with me (he's looking for projects in Griffin) and he was practically GIDDY!! I collected a small donation today and will be making one myself tomorrow. I am trying to collect money for this cause. If the money isn't raised, we can stage a peaceful protest outside Haistens that morning. As Americans and citizens of Griffin, we have the right to do that. Why is there no comment that it was owned by the Haisten family for many years and domiciled their funeral business?